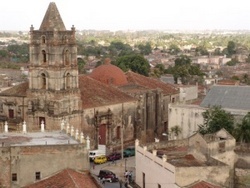 Researchers from Camagüey are still unable to resolve an enigma of almost 500 years of existence: the second location of Santa María del Puerto del Príncipe, current Camagüey City. Archeologists and other specialists started an exploration in 2008 but they obtained no solid evidence about the place, one of the three stops made by one of the oldest Spanish settlements in the New World. Different kinds of tests, geophysical methods and terrain superficial inspections have been applied during the study, still unconcluded, but so far only roof tiles and dishes from 19th and 20th have come out to surface. The epoch of the found material keeps no relation at all with the alleged site, supposedly erected in 1516 and moved to the third and definitive location in 1528. The search has been held in two areas marked by the experts who count with little and inaccurate data to carry out their investigation. Both sectors are irrigated by Caonao River, where troops leaded by Pánfilo de Narváez committed a slaughter, the most infamous native killing on the island. The two zones are located north to Camagüey City and were considered after a long consult of books, old and new maps as well as Cuban and Spanish archives. Earlier investigations did not succeed trying to establish the original place of the foundational site of the city, described in documents near the shore of northern Nuevitas Bay between 1514 and 1515, according to versions not proved certain yet. The oldest part of Camagüey City was officially declared World Heritage Site last February 2nd.